Welcome to the Community Health Center Association of Connecticut! Incorporated in 1989, the Community Health Center Association of Connecticut (CHCACT) is a not-for-profit organization dedicated to strengthening and supporting the clinical and administrative operations of community health centers across Connecticut. CHCACT's mission is to advance and align the work of health centers, with stakeholders, to improve the health and wellness of all. "We help health centers do what they do, better." 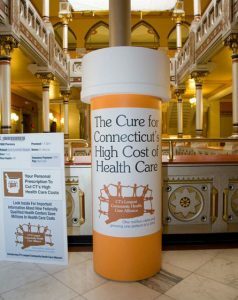 On behalf of its member health centers, CHCACT advocates for issues concerning the vitality of health centers and their ability to provide high quality, comprehensive health care to people in Connecticut. CHCACT and health center staff provide testimony at public hearings and work with coalitions to improve health care access and outcomes. CHCACT also plays an active role in health policy discussions by participating on key advisory councils. We work closely with policymakers, elected officials and residents to ensure the delivery of high quality health services and social programs available through Connecticut’s health centers. Learn more about Advocacy here! CHCACT receives and administers federal, state and private foundation grants that fund programs and services at health centers. These services include case management for children and families infected or affected with HIV/AIDS, outreach/enrollment for HUSKY/Medicaid and Access Health CT, quality improvement programs and more! Learn about CHCACT programs here! CHCACT offers training and technical assistance for all facets of health center operations, both clinical and administrative, based on needs identified in annual surveys of health center staff and leaders. CHCACT provides trainings for clinical staff, HR directors, finance staff, compliance officers and more. We also provide individualized training and other resources to each center, such as preparing for natural and other emergencies, sharing best practices, and up-to-date information on state and federal policy changes. Find CHCACT trainings and other interesting events here!